Miniature micropower motion detector module uses a digital pyroelectric infrared sensor to detect a moving human or animal, operates on 4 to 15 volts and can directly drive a LED or relay. This module can be used with a FL40 or FL65 Fresnel lens or other types of lens. A Glolab KIT consists of a PC board and parts that must be mounted on the board and soldered in place by a user. A manual with assembly instructions, schematic diagram and physical layout diagram is included with a kit. Other user supplied parts may be required in order for a kit to perform a specific function after it is assembled. These basic kits include the components needed to build a functioning wireless remote control system with only the addition of power sources and some wires. The kits uses RF transmitter and receiver circuits that operate at 418 MHz with a range of up to 1000 feet. Thanks to these new modules the problems associated with building your own transmitter and receiver such as tuning by adjusting capacitors and inductors are things of the past. 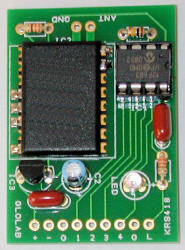 Nutchips are programmable chips with thousands of applications. Nutchips are different because they use truth tables instead of a programming language. This is what makes them so easy to use.